1. It was too hot in New York. I mean miserably, painfully hot. Hmm. 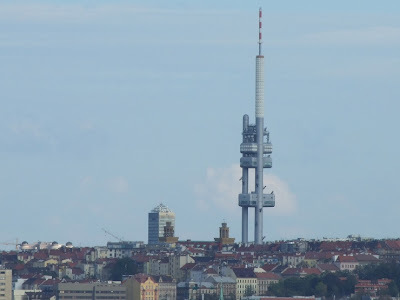 There seems to be something strange about the Zižkov television tower in Prague. Let's take a closer look, shall we? OMG! There are evil BABIES crawling all over the building! And some of them have no faces! Eeeeeeeeek! 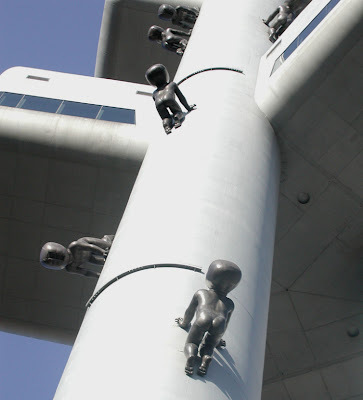 They're the work of Czech sculptor David Černý. That...goes right next to Miranda Cosgrove swimming in a giant coffee cup and the disgusting green tea frappichino I had yesterday (it tasted like candied oranges). That's so creepy and sick! Yuck! Wow. 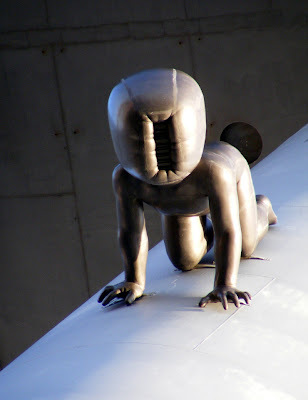 What kind of person uses their wonderful artistic talents to create silver babies with no faces climbing up a TV tower? I soooooo want to meet them!!!!! Wait - you're almost done with a new book? Is it still for teens, or is it going to be for adults? What's it gonna be about? Will it still take place in New York? Oops. You're probably not allowed to say, are you? Ahhhhhhh! I must know!!! That is freaky. And I wouldn't know about heat and low activity. Around here, except for parades, it's just general low activity. Or, in the middle of negative thirty weather, no activity. Another Random comment - sorry about this - but I thought I'd let you know that my daughter is gathering as one of the Irregulars for BookPeople's Kiki Strike camp this week - we dropped her off this AM, equipped with several hats (for costume/stealth/trailing training) a sack lunch, some water and sunscreen - they're apparently going to be getting some drama out of this week. I can't wait to hear her take on the day. This is... interesting. This person must have had an intriguing childhood! He must be almost as twisted as I am! Ahhhhhhh! Faceless babies! I agree with dante's inferno very intriguing childhood indeed! It feels soo nice to be in 90 degree weather! I love the heat! Anyway, your third book is comming out!?!? OoO I can't wait! Chris: There's a Kiki Strike camp?!?!?!?!?!? HOLY CRAP!!!!!!!!!!!!!! I didn't know that! Where do you get info?!?!? aaaargh................. oh well. Tae me to Austin, TX people! Be glad it's hot. It's been raining off-and-on ever since it stopped sleeting months ago here. Anonymous #3: Yes, it's for teens. Adults bore me. Kidding! I'll write a little post about it soon. Only half of the story takes place in NY. Chris: Thanks so much for reminding me! Dangerous: Soon all will be revealed. OMG! Those sculptures are cool to the max. Can't wait to read the book! Adults bore me, too!